Make your own "children" and decorate them with size 18 month clothes which you can pick up inexpensively at garage sales. 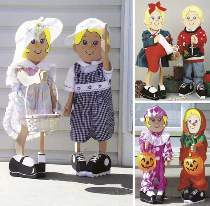 Kids are shown here dressed for Summer, Halloween and Christmas. Notice those cute "knock-kneed" legs and those fantastically silly shoes. Making these two kids is far less expensive and much more fun than those expensive collectors' dolls. All patterns are drawn FULL SIZE. Very easy painting patterns. Kids stand 30"H. Order 1 pair #1287 White Shoelaces separately.